William Crump is an interesting marriage of the complex sophisticated flavours of Cox's Orange Pippin with the refreshing fruity flavours of Worcester Pearmain. Please fill in the details below and we will let you know when William Crump apple trees are back in stock. William Crump is in flowering group 3. William Crump is self-sterile and needs to be pollinated by another tree of a different variety nearby. Since it flowers in the middle of the blossom season it can be pollinated by most other apple trees. William Crump was raised by a Mr Carless of Rowe's Nurseries in Worcester at the start of the 20th century. 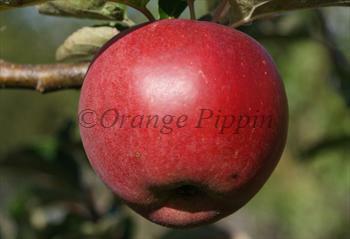 It is a cross between Cox's Orange Pippin and Worcester Pearmain. It received the RHS Award of Merit in 1908.